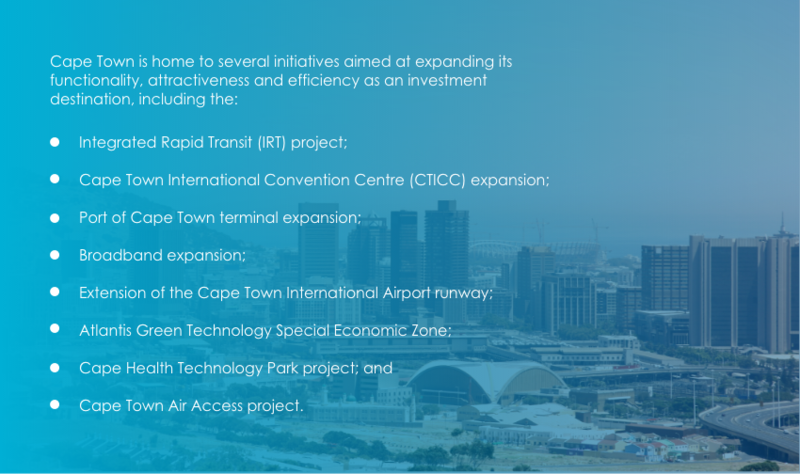 Cape Town has sound infrastructure across all sectors, commitment to entrepreneurial expansion and visible evidence of investment in our world-class CBD. The City spends approximately ZAR6bn on infrastructure annually. Since 2014, the City has made significant advances in harnessing the power of technology. The municipality has to date installed fibre-optic cables with a combined length of over 800km and has provided accelerated internet access to over 1 million people through nearly 400 free Wi-Fi zones spread out across the metro. The City of Cape Town’s Transport and Urban Development Authority (TDA) combines the functions of integrated transport, urban development and elements of human settlements into a single governmental body, thereby dramatically improving efficiency and focusing on spatial transformation of Cape Town. One of the City’s biggest infrastructure projects is the Development of Cape Town’s Foreshore Freeway Precinct. The City’s unfinished freeways that straddle the Foreshore Freeway Precinct have been the subject of much debate and discussion. For many years consideration was given to decide on the best way to deal with them, in order to unlock the economic potential of a significant segment of the City. This had to be done in a way that would potentially enhance and complete the urban design of Cape Town’s bustling Central Business District (CBD).